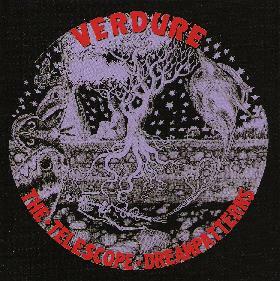 Verdure - "The Telescope Dreampatterns"
Folk-psych fans step right this way. No pushing or shoving please. Verdure is a solo project from San Francisco resident Donovan Quinn, who has been home recording under the Verdure moniker since 2001. The promo sheet lists a gamut of pivotal influences including Bob Dylan, Incredible String Band, Captain Beefheart, The Fall, Robyn Hitchcock and Syd Barrett. An interesting range to be sure. Other than a few guest appearances this is a solo effort through and through. The Dylan influence is easily heard in Quinn's vocal style, though the music, while certainly folk based, is dripping with psychedelic elements. And while there's certainly a 60's flavor throughout, there's absolutely nothing retro about Quinn's style. He has a real flair for catchy yet mind-bending songs, with oodles of well placed efx and instrumental embellishments, all brought together in a busily varied stew that at all times retains it's direction and cohesion. Among my favorite songs is "The Greentrees", which has a kind of a Bob Dylan singing Neil Young's "Down By The River" feel, but with the Verdure magic touch. "The Coffin Splits In Two" is a garage rockin' lysergic pop-psych song with a 60's edge, and includes both folk and acid-rock elements, with a trippy mixture of acoustic and electric guitar. "Moonlanding" has a fun carnival atmosphere with a folk-psych foundation and cool organ embellishments. "Seeing The Telescope Dreampatterns" is a schizophrenic tune that is one part experimental sound and drone collage and one part dreamy psych song. One of my favorites of the set. For pure song, "The Sea Funeral" is probably my favorite. It's just a basic song, but it's got a great grooving folk vibe and a cool ripping acid guitar solo. Scrumptious! In summary.... well this is just a really cool album. Nice songs with a lot of thought put into how to enhance them with variety and artistic touches without overwhelming them. Highly recommended. Oh, and I can't conclude without mentioning the beautiful cover artwork by Dream Magazine publisher George Parsons. Gorgeous! For more information you can visit the Verdure web site at: http://www.verduremusic.com.